Sujatha Singh will meet First Deputy Foreign Minister Vladimir Titov and Deputy Foreign Minister Igor Morgulov for wide ranging talks. 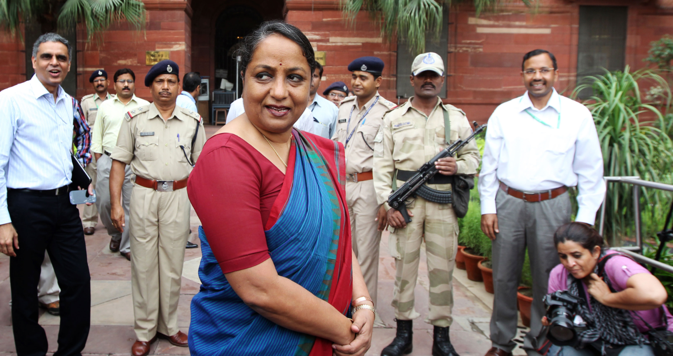 India’s Foreign Secretary Sujatha Singh is in the Russian capital for the annual Foreign Office Consultations with First Deputy Foreign Minister Vladimir Titov and Deputy Foreign Minister Igor Morgulov. The situation in Ukraine, energy cooperation and a review of ministerial level visits, including the 15th annual Indo-Russian summit will be on the agenda. It is unclear whether Singh will call on Russian Foreign Minister Sergei Lavrov. Last week, it was reported that India and Russia signed a deal for the construction of the third and fourth units of the Kudankulam Nuclear Power Plant. There has been no official confirmation from Rosatom or from the Nuclear Power Corporation of India Ltd. Indian External Ministry sources say an official statement on the agreement is likely to be made when the foreign secretary is in Moscow. India has refused to take a confrontational approach against Russia on the on-going Ukrainian crisis, with New Delhi abstaining in a motion at the United Nations condemning the reintegration of Crimea with Russia. Earlier India’s National Security Advisor had said that Russia had legitimate interests in the now-Russian region. Sources tell RIR that India is worried about the supply of spare parts from Ukraine for its Russian armaments. This issue will also be high on Singh’s agenda. Russia is expected to raise the issue of further Indian participation of Indian companies in Russian oil and gas projects. Rosneft Chief Executive Igor Sechin made a big pitch last month in New Delhi for greater involvement of ONGC and Reliance in oil exploration projects. Sources say India will push for a joint feasibility study for a gas pipeline connecting the countries via Central Asia. Sources tell RIR that Singh will also discuss the post-election scenario in India and assure the Russian side that the positive trajectory of the bilateral relations will continue no matter which party comes to power. Vladimir Putin is expected to meet the new Indian prime minister several times this year, starting with the G20 summit in Australia, followed by the BRICS summit in Brazil and the 15th annual Indo-Russian bilateral summit, which is likely to be held in New Delhi in October.